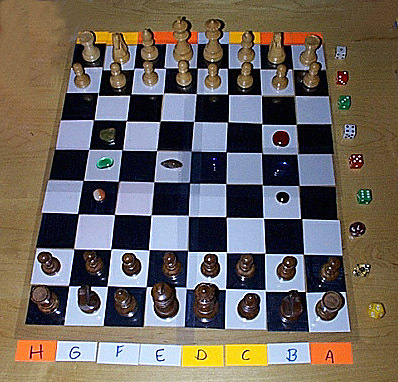 Here are some photos of a setup for Eight Stone Chess, pieced together from Chess Construction Set materials. The board is made from some of my 2" posterboard tiles. The set used is David's large wooden set. The stones used include some I bought in a craft store and some I previously picked up in a New Age store. 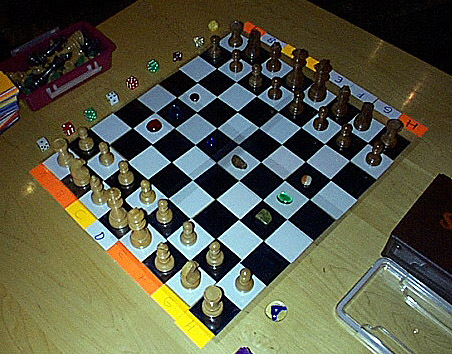 Dice and half tiles are used to mark the ranks and columns. Click on the thumb nail images for larger images.